As a six year-old John Ward of Taranaki saw a pheasant mounted on display in a Stratford sports shop window and he desperately wanted it or one like it. “I would have done anything to get that pheasant,” he said. He didn’t muck around. 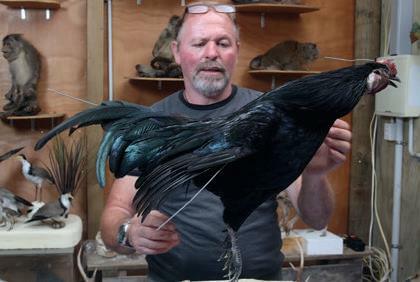 He taught himself the art of taxidermy with the help of a few books and aged eight he mounted his first bird—a pukeko. From there he would pick through his father’s mates’ duck shooting catches and select the best for mounting. Aged nine he mounted his first animal, a ferret, and at 10 a peacock. As a teenager he polished his skills, working on ducks, rabbits, possums and the odd lamb. His biggest task was mounting an emu. John mainly specialises in birds. 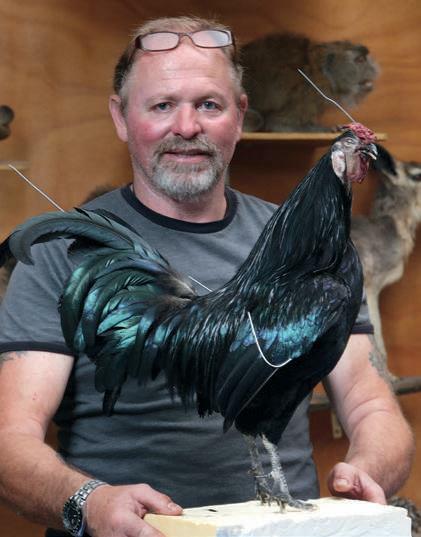 Manutahi Museum, set up six months ago, and taxidermy are an absolute passion for John and his collection is astounding. It’s world class. Five years ago John and his wife Lynda purchased two hectares near New Plymouth that included a big shed that once was used to make kitchen units. “It’s perfect for the collection, but as the number of exhibits grow it would be good to expand,” says John. He worked in the oil industry for years but now, aged 55, he’s doing what he loves most, setting up and running the museum. Lynda does the admin side and is right behind John, although there was a time when he worked on the kitchen table and they had to eat off their laps while birds in various stages of metamorphosis lay on the table. “That was a bit strange but he’s got a bench in the shed now,” Lynda says. The three-metre high polar bear from Canada that greets visitors to the museum. On entering the big shed one is greeted by a ferocious, looming three-metre- high polar bear, standing on its hind legs, with a full-size lion and lioness calmly sitting behind it. From there on there are almost too many exhibits in the museum to take in. John’s enthusiastically very much at home—these are his babies. “What I’m doing is preserving the past, especially for coming generations. I won’t mount native birds and I won’t kill anything to mount. “People bring me creatures to mount that have been killed by cars. I’m a meat hunter and hunt for the freezer.” John has spent many years hunting and still takes his kids and their mates Samba deer hunting at the back and beyond of Whanganui. “I’ve been raised and spent my whole life living on deer, pig, goat and rabbit meat.” John is actually fond of animals. He spent time as a dairy farmer but left because he didn’t like taking the bobby calves from their mothers and killing them. “I don’t glorify killing animals. Most creatures I mount have been killed accidentally or have died. I’ve lost count of the number of exhibits I have. The collection is an absolute passion—I’m totally addicted to it." 1: A golden gibbon 2: An African black-backed Jackal 3: An African lion, one of two that died at a Japanese wildlife park. 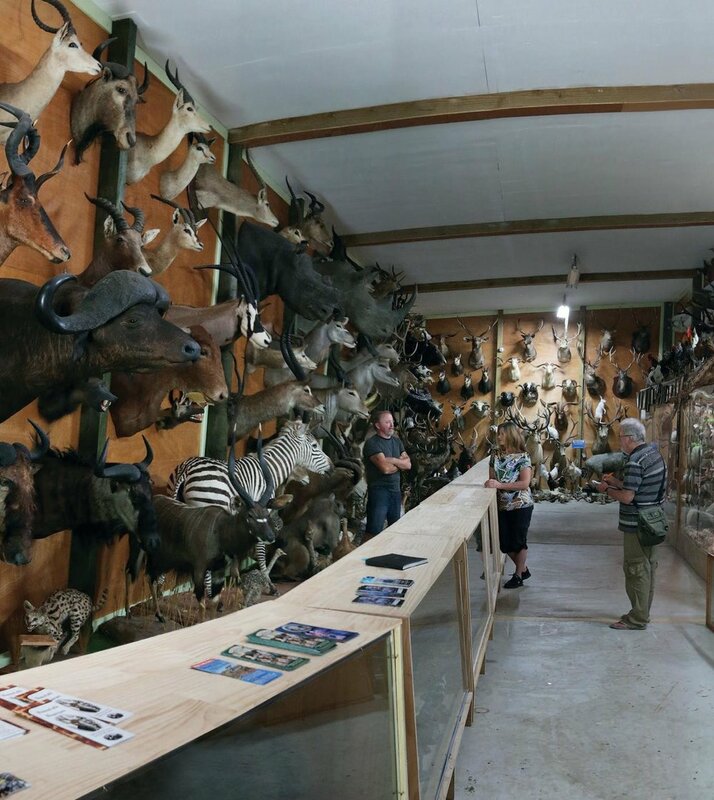 The collection is extremely diverse and a good chunk of it came from two old- time safari hunters, who hunted all over the world, bequeathing their mounted collections to John when they died. These guys, Jack Price of Thames and Max Motley of Havelock North, had extensive collections they wanted to go to a good home and put on display. “Max was a master of hunting and taxidermy. He left me two big truckloads of animals shot in Africa, Canada, America and all round the world. 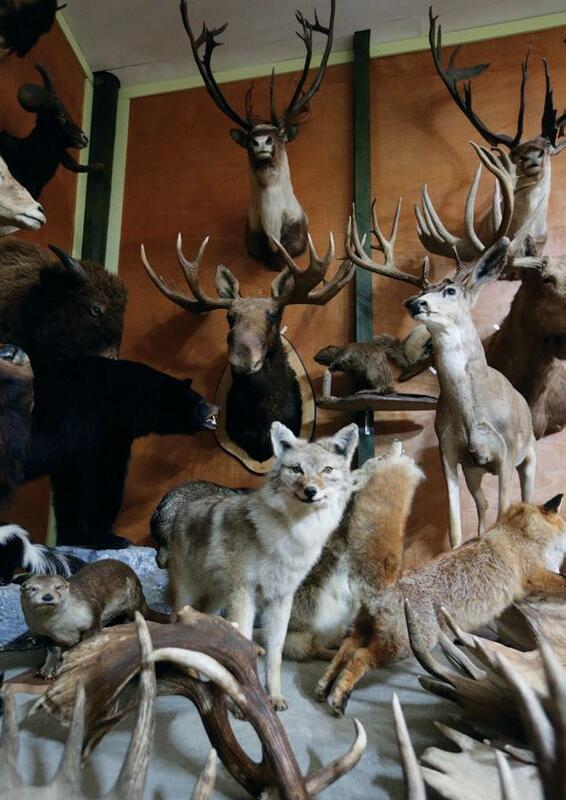 “A lot of people these days are not into having animal heads hanging on their walls—it’s not so fashionable and a hell of a lot of mounted specimens end up thrown into the dump. It’s a shame. Some I have brought from Trademe.” He points to a mounted, two metre- long fresh water Johnson crocodile, which was stored for years under an elderly woman’s bed in Tauranga after her husband died. Driving back to Taranaki he stopped for petrol, with the croc lying on the attened front seat through to the boot. “I told the young girl working the petrol pump not to pat my pet and got a great reaction,” he says with a grin. The magnificent polar bear was purchased by John as a salt-cured hide and head from Inuit people in Canada 20 years ago. He imported it and had it mounted by a fellow taxidermist. It’s even been seen in Christmas parades. A selection of Australian parrots and birds. 1: Major Mitchell cockatoos from Australia 2: A snowy call duck. There are many thousands of exhibits. The two lions died naturally at a wildlife park in Japan. They were mounted and displayed in a car yard window for a while before John found them. Full-sized animals include two timber wolves from Canada, a zebra, a black bear from Canada, a range of foxes, including a white Arctic fox, a cheetah, an armadillo, a collection of monkeys, a wallaby, wild dogs including a jackal, a wolverine, coyotes, a range of snakes, including dancing cobras and a python, various lizards and iguanas and many, many other creatures. Mounted heads include a black rhino and a white rhino, a yak, several moose, thar, bison, elk, caribou and various buffalo from around the world. The bird collection is staggering. 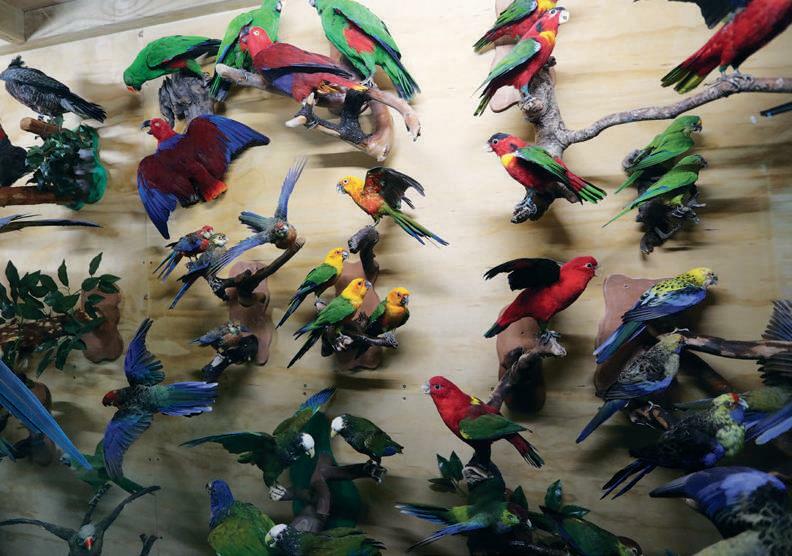 An Australian section includes many parrots and even a wedge-tailed eagle. There are birds from all over the world including a collection of owls. The last two Egyptian geese found in New Zealand are on display after spending 15 years in a freezer. The bird life ranges from a complete emu to tiny birds. Anyone into hunting will be interested in the collection, which includes a vast array of prize- winning antlers, including the biggest samba head found in New Zealand. John has picked up many trophy heads and antlers— elk, moose, caribou and even massive Texas longhorn exhibits hang on the wall. There’s also a collection of insects from around the world and a row of skulls, including a leopard, a grizzly bear, a baboon and a lion; and strange objects like giant shells. John has by no means finished building up the museum. He would like to build a river scene and include a giant salt water crocodile. He also wants to write a book on the collection and the stories behind many of the exhibits. He says anyone wanting to get rid of mounted specimens should contact him before throwing them out. 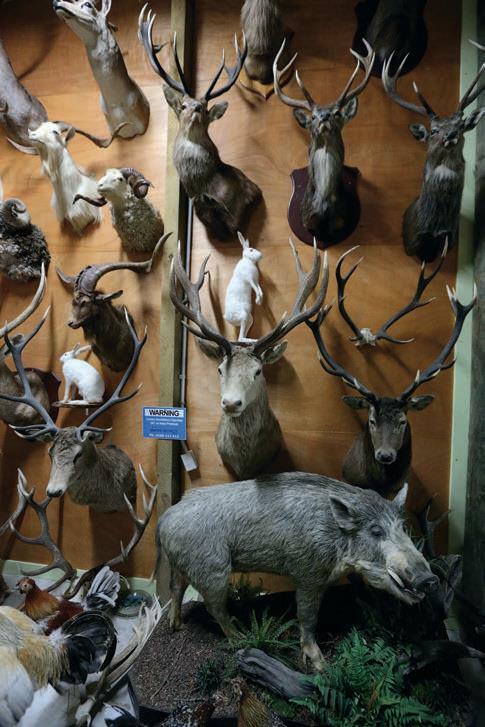 Tour parties and visitors are welcome at the museum and John and Lynda can be contacted at taxidermy@slingshot.co.nz. The word taxidermy originates from the Greek words taxis (arrangement) and derma (skin). 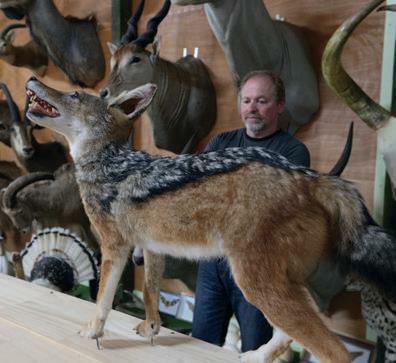 Preserving animal skins goes back to the dawn of time and although the ancient Egyptians embalmed animals to place with the mummies in tombs, the art of taxidermy didn’t really begin until the mid 1700s. By the 18th century, almost every town in England had a tannery business. In the 19th century, hunters began bringing their trophies to upholstery shops, where the upholsterers would actually sew up the animal skins and stuff them with rags and cotton. The term “stuffing” or a “stuffed animal” evolved from this crude form of taxidermy. It reached a peak in Victorian times, when exploring and safari hunting was the rage and mounted heads on the walls and posed animals were very popular in homes. Displays of birds were particularly common in middle-class Victorian homes—even Queen Victoria amassed an impressive bird collection. Taxidermists were also increasingly used by the bereaved owners of dead pets to “resurrect” them. There has been a resurgence of this today. An arctic wolf, a timber wolf, a coyote and a black bear amongst others on display. 1: A novelty — an ostrich emerging from an egg 2: A coyote takes centre stage 3: A blue Captain Cooker boar with friends. is then removed and the mould is used to produce a cast of the animal called a “form”. Forms can also be made by sculpting the animal first in clay. Many companies produce stock forms in various sizes. Glass eyes are then usually added to the display and, in some cases, arti cial teeth, jaws, tongues or, for some birds, articial beaks and legs can be used. An increasingly popular trend is to freeze dry the animal. This can 3 be done with reptiles, birds and small mammals such as cats, large mice and some types of dogs. Freeze drying is expensive and time consuming. Large specimens can be required to spend as long as six months in the freeze dryer, although it is the preferred technique for pets. John said you first remove the stomach, insect-proof the specimen, put wires down the legs and put it on a base. are kept out of direct sunlight or they will fade and must be careful insects such as moths do not ruin the skin. 1. Padding the legs with wool and wrapping them. 2. Threading wire through the wings to keep them stable. 3. 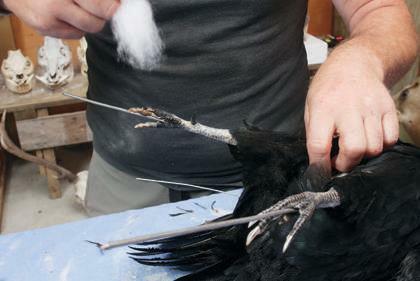 Binding cotton onto the wings and building up the legs with ller to replace muscle. 4. Fitting a polystyrene body form into the skin. 5. Filling (“taxiing”) the skin over the form. 6. Inserting cotton to enhance the shape of the bird before stitching. 8. Getting the final shape of the bird right. 9. Blow drying the bird to get the plumage looking good.